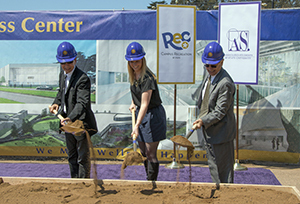 The groundbreaking took place today for the Mashouf Wellness Center, the first major facility to be built on the San Francisco State University campus in more than a decade. Scheduled for completion in 2017, the state-of-the-art recreational complex incorporates the latest in green technology and will serve as a hub of student life. Alum and founder of the women's fashion brand bebe Manny Mashouf (left), President of Associated Students, Inc. Phoebe Dye and SF State President Les Wong participate in the groundbreaking ceremony for the Mashouf Wellness Center. "This boldly designed facility will become a new campus crossroads, not only making our campus more beautiful but providing tremendous resources for the health and wellness of our campus community," said President Les Wong at the groundbreaking ceremony. Construction of the $86.5 million facility is being funded by student fees and private donations, including a lead gift from alum Manny Mashouf, founder of the women's fashion brand bebe. "My family and I are deeply honored to have this structure named Mashouf Wellness Center," Mashouf said at the ceremony, which was attended by more than 150 students, faculty, staff, family and friends. "It's a legacy for me and my family for generations to come." Located at the corner of Font and Lake Merced boulevards, the 118,700-square-foot facility will be easily accessible from student housing and the center of campus. The facility will feature an indoor jogging track, fitness and weight areas, pools, a sauna, a climbing wall, racquetball courts, two multi-use courts, fitness studios and a large multi-use space, which will host indoor soccer and other sports as well as student events such as lectures and dances. 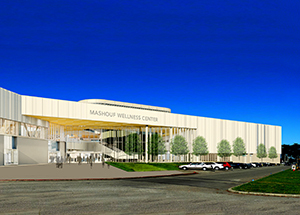 The Mashouf Wellness Center will offer 118,700 square feet of space for recreation, serving as a new hub of student life. The campus' current recreation facilities are shared with both University athletics and the Kinesiology Department, limiting the amount of space and equipment available, said Pam Su, director of campus recreation. "When the current facilities were built, the campus was much smaller than it is now, so they were designed to serve a smaller population," Su said. "The Mashouf Wellness Center will be a wonderful new space where students can do healthy activities from early morning until late at night, and it will really draw people together socially and make a big impact on student life." The Center is designed to be in line with the latest advances in green building technology and is on track to be rated LEED (Leadership in Energy & Environmental Design) Platinum, the highest designation for green construction. Construction plans incorporate cutting-edge technologies that will significantly reduce energy and water usage. Pool discharge water will be captured and filtered for reuse in toilet flushing, for example, and a greywater system will repurpose shower and sink wastewater to irrigate the site. Additional environmentally friendly features will include LED lighting, drought-resistant landscaping and a displacement ventilation system to minimize the use of air conditioning. "Making the statement that the building itself is a healthy space carries over into everything that goes on inside that space," Su said. 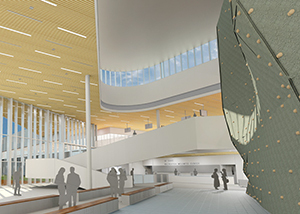 "All these features are being built into the physical construction -- like fresh air and good natural lighting -- that will have a positive impact on people's experiences as they use the building." SF State's student government, Associated Students, Inc. (ASI), has been deeply involved in plans for the Center throughout every step of the process, said ASI president Phoebe Dye. "It's sort of our baby," Dye said. "The environment on campus is aimed to promote general well-being, whether that's physical, mental or spiritual, and we want to provide avenues for students to achieve their goals when it comes to well-being. Students have worked really hard to make the Center a reality." The facility will be the first new building on campus since the Village at Centennial Square student housing complex was completed in 2001. The most recent major construction project was the J. Paul Leonard Library, which was fully renovated and received an addition of more than 70,000 square feet in 2012. "We are pleased to have found such a fitting way to recognize the tremendous gift that Mr. Mashouf and his family made to the University," said Robert Nava, vice president of University Advancement. "Through all of his success, Mr. Mashouf has shown incredible generosity to so many, including the students of SF State. It's appropriate that this new center for student life will bear his name." Learn more about the Mashouf Center and its construction.